The dog’s in my yoga practice. Posted on 04/30/2012 by Stand and face the sun. 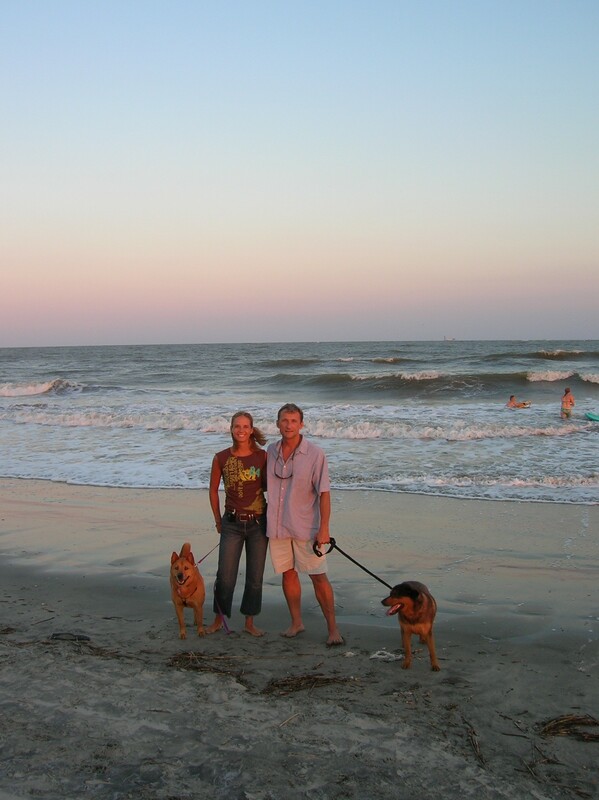 Me, Bruce, Ginger & Traylor, Sullivans Island, SC. I am a dog owner and have been for about 16 years. I have found dogs to be great companions. They do a great job at not expecting much, but being grateful for everything they receive. We could probably learn a thing or two from them. What is it we could learn? We could learn to always stretch after lying down, we could learn to protect our home from intruders, to play more, to love with out conditions, to be present, to hang out in packs with like-minded people, and to fetch a ball. Ok, well maybe not the last one. Yes, we should stretch after lying down. Dog’s instinctively know that after their spine has been in flexion they should stretch it into extension. That’s why after your dog has been curled up in a ball for a while they will usually do one good downward dog and one good upward dog, before they carry on. Don’t believe me? Just watch your dog get up after his next nap. It is best to do yoga in the morning, after you’ve spent several hours lying horizontal and fairly still. Most people however roll right out of bed, down some coffee and carry on without ever addressing their bodies needs. Time seems to be one of the greatest available excuses to NOT do a little yoga. Is that an excuse? For years, I have seen people make time for what matters in their life. So the question is, does your body and mind matter? What about protecting our home? I know people who have high-tech alarm systems for their homes, as well as a loyal dog, who will stand and deliver protection, if necessary. But the home that I’m speaking of is your body. This is where you really live. You experience life through your body. People are not protecting their bodies from intruders. They are allowing poisons into their bodies every day with things like pesticides, fried foods, polluted air, too much sodium, sugars and chocolate (oops, not chocolate, thank God someone discovered that chocolate is a good source of antioxidants). Toxic things come into our mind through, media, negative people, and negative thoughts. The body is abused with not enough rest and sleep. Dogs know to sleep with their ears standing guard, listening for any sounds that might alert them to danger. We have this same ability in our bodies. Our gut instinct is a great example of a warning system. The human body does give us warning signs to when there has been an intruder, such as indigestion, vomiting, diarrhea, congestion, or fever. But what about the subtle discomforts we ignore for far to long, like the ache in our feet, or the twinge in a knee, or the tightness in our neck? Only once my dog knows that the thing that alarmed her will do her no harm does she relax and accept the thing she felt threatened by. Our inner guard dog instinct seems to have gone off duty. Marketing plays on the notion of telling you all the great things about a product, golden promises of happiness if you consume, wear or apply their product. They know that if they told you its flaws, or dangers you wouldn’t buy it. Yoga should help raise our hackles, so to say. To become more sensitive to things that come into our space, that will impact or body and mind. Sensitivity is our tool for refinement. Just how sensitive can we become and how well do we trust what it is we are feeling? 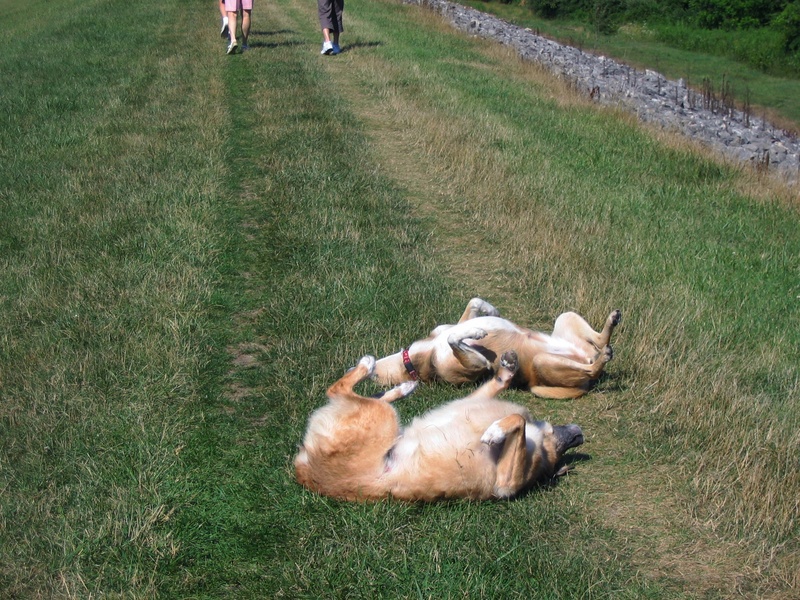 Tonka and Indy rolling in the sun. How about the idea of play. Dogs love to play. They will take the initiative to start a play session by either bringing you a ball, or by bowing down into downward facing dog pose. Downward dog is the universal dog sign for “game on”! Sometimes when left to their own devices they will play with their own tail, or as my silly dog does, she has learned to play with her own leash. They won’t be denied that release they get from playful exertion, nor should you. I have found yoga to be very playful. I found that some yoga poses are similar to things I was thrilled to death to try when I was seven. Handstand is one of my favorite postures in yoga that automatically makes me feel invigorated and happy. There are gentler postures too, that have a child like behavior to them. Downward dog reminds me of when I played wheel barrel with friends, walking around on our hands. Rabbit pose reminds me of tucking into a ball to jump into the pool yelling, “CANNONBALL!”. Standing straddle poses remind me of jumping jacks. Locust pose reminds me of playing airplane on top of my brothers feet. Triangle pose feels a lot like the movement into a cart-wheel (which I still do in open grassy spaces). Frog pose takes me back to when I played softball and I was the teams’ catcher. Lunges take me back to stepping into a sprinters block when I ran track. Child’s pose is a lot like the shape I would sit in making sand castles, at the beach, for hours. So every time I go into these yoga poses, as a 40 something adult, it connects me into the aspect of play that keeps me feeling youthful and nostalgic. Which I would guess lowers my blood pressure, balances my mood and overall makes me feel jovial with myself and others. Play is definitely important to our overall health. Dog’s love without conditions like no other being. I have seen this 1st hand with dogs that are living in squalor, with neglectful owners, and they still love their owners despite their circumstance. They don’t say “I’ll love you more when you brush me”, or when you play fetch with them, or if they get a steak dinner. They love whatever they get, period! We however say things like “I’ll love myself when, I am 10 pounds skinnier”, or “when, I have a college degree”, or “when, I have the husband that loves me back”. We are always waiting to love ourselves more, later. We seem to not be able to love ourselves today, or even tomorrow. Maybe we will in a week, or a year, or in the right, town, house or car. Why the stipulations? It’s like we are building up to some great big moment in our lives. What happens after we hit that pinnacle point, when all of our ducks are in a row? Will we then love ourselves as we are, or love our husbands as they are? Sometimes you are not going to reach this pinnacle, so what then? Dog’s live in the present. My dog’s love their twice a day walks. They know they are coming because if by 5:00/6:00 they haven’t gotten the second one they begin to ask us with displays of dog behavior that says “Hey, what’s up?” But even if they still don’t get that walk they just wait, patiently, in the moment. The other best example I can think of to show you their amazing ability to be here now, is; they might meet a new dog and have a 30 second scuffle establishing some terms to their new relationship and then they move on, there is no grudge holding, or revenge planning. They accept and go! They don’t dwell in the past with remorse and anger, they don’t rush out into the undetermined future with planning the next attack to settle their score. They just let it go and go back to enjoying life. We have got to stop hanging on to things that are unchangeable because they already happened. We should learn to be content, in the moment, even if it’s doing something hard, or confrontational. This too shall pass, just wait for it. Dog’s scuffle, I know this because my dog has what people call a greeting disorder. Even with these run in’s that seem like they should be life altering, she let’s it go and moves on, even to the point of being great dog friends with some of the dog’s she initially put her guard up for. Things that are uncomfortable will pass. Yoga is a great place to practice strengthening your ability to see it thru and get over it. It’s likely, you will be uncomfortable in about 70% of every yoga practice you show up for. We are putting our bodies in some very awkward positions, but if you just BE with the sensation, listen to your breath, and your body you will find that the sensation is changing, and is no longer as uncomfortable as it once was. This can happen even within the 5 breaths of an ashtanga yoga pose, in just 5 breaths! This is what’s so nice about the memorization of the ashtanga yoga sequence, is that once it is put to memory you can get down to the job at hand of being present with each stretch because you are no longer worried about the future. The best things dog’s do, if allowed to these days, is they hang out in packs. Spend a little time at a dog park and watch this at work. Dog’s like to be around their own species and they know that there is greater success in numbers. They learn how to work together, and they know how to honor each others strengths. If you are having hard time meeting some of your goals, then start hanging out with like-minded people. Let them support you, inspire you, and help you achieve greater success. This will always be the argument for why yoga works in a class room environment. We are there to support, inspire, and strengthen each others assets. It is good to have a home practice for more personal reflection but it’s also important to have a place to go to for inspiration, and even accountability. When I practice with my teacher, he holds me accountable for my results, there is no finger-pointing, no excuse making, there is just what I am doing in the present. Some days I need help holding my feet to the fire, and that’s what I get when I am practicing yoga in a roomful of other yogi’s. The collective energy of it makes us all a little better, more hardworking and better at being team players. We are strengthening our pack, our pack of downward facing dogs. Now, the whole fetch the ball thing… well believe it or not we can learn from dog’s in that regard too. The only way you can catch a ball is to keep your eye on it. So whatever it is you want from yoga or life you must keep your eye on it; one pointed focus, one pointed dristi. Where we gaze and what we focus on determines a lot. Dog’s have two more feet than us, and we have thumbs, but we all just have two eyes. So look at your dog’s next time a little more closely for all the lessons you can learn from them. Take those lessons to your yoga mat and out into the world. Focus on what feeds your soul more than what feeds your belly. Besides your soul is going to out live your body. So the advice from my four amazing dogs is…stretch more, protect your home, play more, love more. NOW! With people around you that support your goals and you will catch what you keep your eyes on! 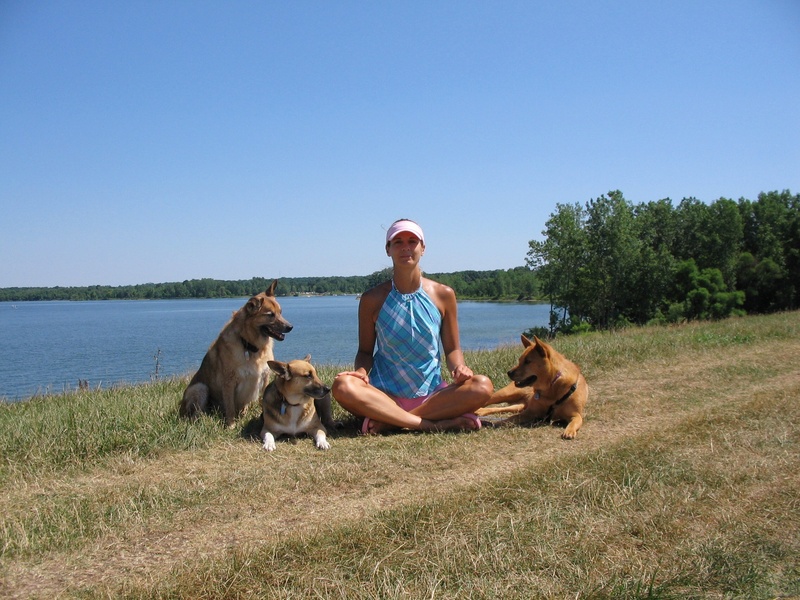 Me, Indy, Tonka and Ginger, Columbus, OH. April is no fool playlist! Posted on 04/02/2012 by Stand and face the sun.